After the last doctor’s visit, we had high hopes. Everything this time around was looking much better than the last, so we were just saying our prayers and hoping for the best. The time leading up to the 8 week ultrasound was rough. Jenn was having terrible morning sickness and having trouble keeping anything down. With some help from some nausea medication from her doctors, we were finally able to get a full meal in her the night before our doctor’s visit. To make matters even more complicated, I had to leave town for the entire week prior for work. 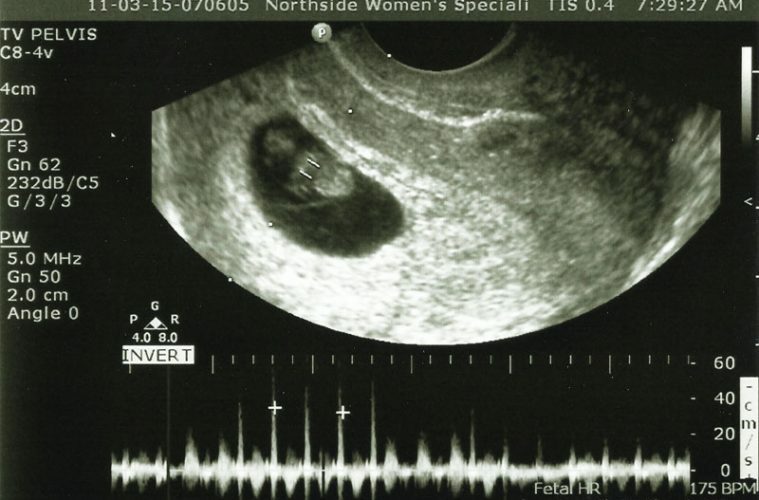 This entire time from finding out we were pregnant again to the 5 week ultrasound until now…we had really been cautious about getting too attached. Having just miscarried not even 3 months ago, it was almost as if this was too good to be true. Even with the more positive outlook this time around, we were still very nervous and had some anxiety leading up to this crucial point in the process. 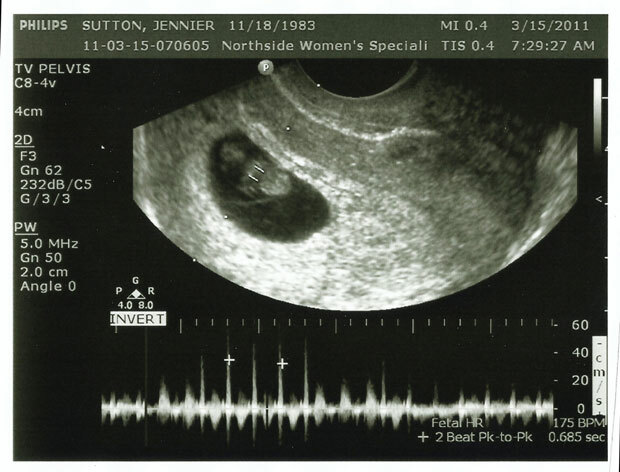 So on Tuesday, March 15th, 2011…we walked into the doctors office to see how things were going. I think you could hear a pin drop as everyone in the room was waiting to see the results. As they started the ultrasound…I saw it. Our baby…alive…growing and with a heart that was strong and beating quickly. They took the measurements and we were at 8 weeks on the dot. Next…they hit the switch and I heard it for the first time. Our babies heart was beating at a strong 175 bpm. There are a lot of experiences you go through in life. Up until this point in mine, that was the coolest sound that has ever graced my ears and it brought a sigh of relief to both me and my wife. We have a healthy baby that is growing. After everything we have been through in the years leading up to this moment…none if it mattered at that moment. I really have a hard time expressing the feelings we were having. The room was silent other than the rhythmic beating of the tiny little heart. It almost seemed to just echo around the room for what felt like days even though it was just a couple of seconds. The look of relief in my wife’s eyes as she listened is something I will never forget. She was finally calm and happy. About the only reaction I could come up with after hearing our babies heartbeat for the first time was…”holy crap”. And yes, I said that out loud. We still have some hurdles to cross and that pinnacle point of 12 weeks is still 4 weeks away, but…at this point in time…everything looks perfect. We are starting a family and we couldn’t be any happier. I finally feel like we can start to get really excited about this pregnancy and move past the events of the past. With something concrete to hold onto, we are moving forward with an excited and scared as hell outlook as we begin this journey that will forever change our lives. Now it is real…and it is awesome. After we got over the shock of what we just experienced, we went over some information on what to expect over the coming weeks…specifically…testing and doctors visits. There is a lot of testing these days that you can get done for various diseases and other birth defects. We will probably end up getting them all done even though it will not affect our decision on the pregnancy. The peace of mind is really what we are after. With the percentage chance of something being wrong so low…it is better to just know and move forward for us. Each couple will have their own opinions and experience, so I can only speak on how we are and what we need to know. This is going to be a wild ride…and I am excited as hell. I can still remember how I felt going for those first ultrasounds. How amazing it was the first time I saw son’s heartbeat on that ultrasound screen, and how reassuring it was to hear it for the first time. My wife has a blood clotting disorder, and because of that we had a high risk pregnancy. The one nice thing about it was that we had ultrasounds a lot more often than most people do – every 2-3 weeks. So we got to become quite well acquainted with our little Carter months before he was ever born. On the other hand my wife was also nauseous for much of the pregnancy as well – and that was not fun. Hopefully that part will get better for you – it usually does after the first trimester. We go today for our 8 week ultrasound. My wife miscarried about 6 months ago and we are nervous and excited too. Rough day to concentrate. Thank you for sharing your experiences to another first time soon to be dad.